Egremni Beach (approx. 1 hr drive from Diodati Villas). 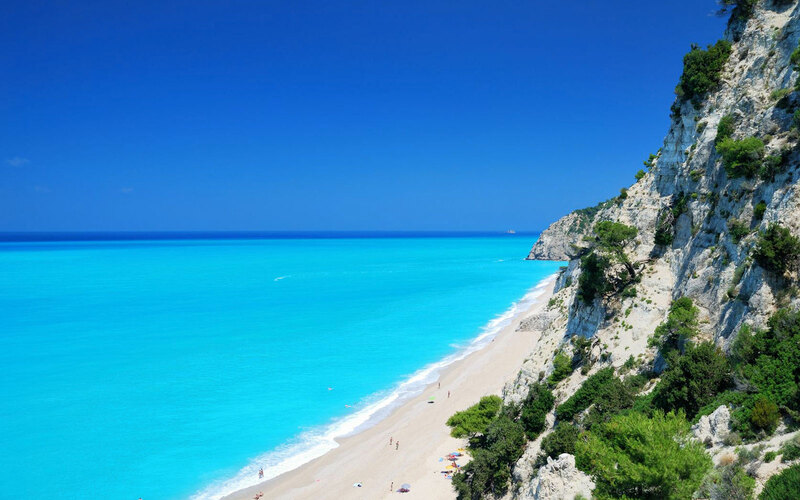 Egremni is a beautiful beach situated 40 km southwest of Lefkada Town. The long sandy beach is surrounded by impressive barren cliffs that create a magnificent backdrop. The white sand, shiny pebbles and crystal clear waters compose an exotic setting that attracts thousands of visitors every summer. It is well-organized with a long row of sunbeds and umbrellas stretching to the end of the beach while you can also track some beautiful and more private spots. Despite the great arrival of tourists here, the rocky landscape offers a feeling of nice isolation. A couple of beach bars are found right on the beach. The unique beauty of Egremni is one of the most photographed landscapes in the world and it offers an ideal swimming experience. Approximately 325 steps lead down to this wonderful beach. The journey down is very pleasant as delightful views of the beach itself appear. It is one of the top beaches in the Ionian Sea and a must for visitors to Lefkas Island. Recently voted among the best beaches in the world!